Electric Icicle has a clear base with bright blue holo hexes, rainbow iridescent hexes and squares, silver holo hexes and tiny diamonds and blue holo stars. All nails are 1 coat over 3 coats of Untrodden Snow. Electric Icicle and Untrodden Snow are meant to be paired together, as apart of Blue-Eye Girl Lacquer's December Duo, and they are amazing together and alone. :) Formula was a little on the thick side, but all the glitter came out easily and didn't need to be "placed" on the nail. Dry time was average, yet it needs a top coat anyways to smooth out so that helped quicken up the dry time. Overall the polish is beautiful and looks great over Untrodden Snow! Frozen Ivy is a deep green jelly with silver and green micro glitters. Shown is 3 coats with top coat. Even though Christmas has passed, you can never go wrong with a nice deep green with added spark. :) Formula was a tad thicker, but still easy to work with and dried quickly. Hypothermia is a dark purple linear holographic polish with vivid purple shimmer. These photos are 2 coats with top coat. Plum Tired of the Cold has a blackened plum shimmery base with gold micro hexes, red hexes, diamonds, and circle glitters, wine and burgundy hexes, black hexes and holo dots. All nails are 3 coats with top coat. St. Nick's Sweet Treats has a clear base with silver micro-flakies, glitters predominantly in gold, red, and white, with extra bits of color splashed in. All nails are 2 coats over 2 coats of Toasty Warm. Snowfall at Dusk has a periwinkle based polish with various shades of blue hexes, squares, anddots, blue-green iridescent hexes, and large white snowflakes. Shown is 3 coats with top coat. While I wasn't able to get any snowflakes out, it's still a beautiful polish with or without them! :D Formula was again on the thick side, yet still dried quickly and the glitter applied nice and evenly. Tacky Winter Sweater is a light pink based polish with sapphire hexes, holo violet hexes, and holographic bright pink hexes, diamonds, and dots, purple iridescent hexes, and light pink snowflakes. Here is 3 coats with top coat. 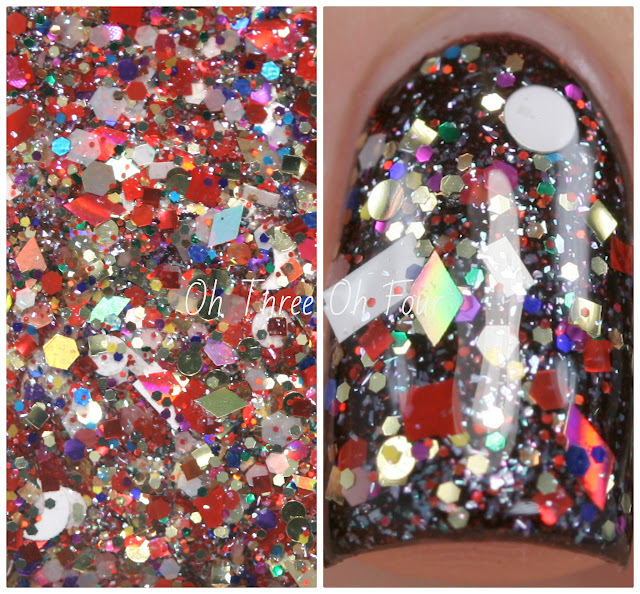 This polish is anything but tacky! As you can see I was able to get the snowflakes out, but it did take some fishing and shaking. My thoughts are the same as Snowfall at Dusk regarding the snowflakes; it looks great with or without them! :) Formula was thicker, yet still easy to work with and with the exception of the snowflakes, all the glitter came out easily and applied nicely. Toasty Warm is a vampy blackened red creme with irregularly shapedred shimmers. All nails are 3 coats with top coat. 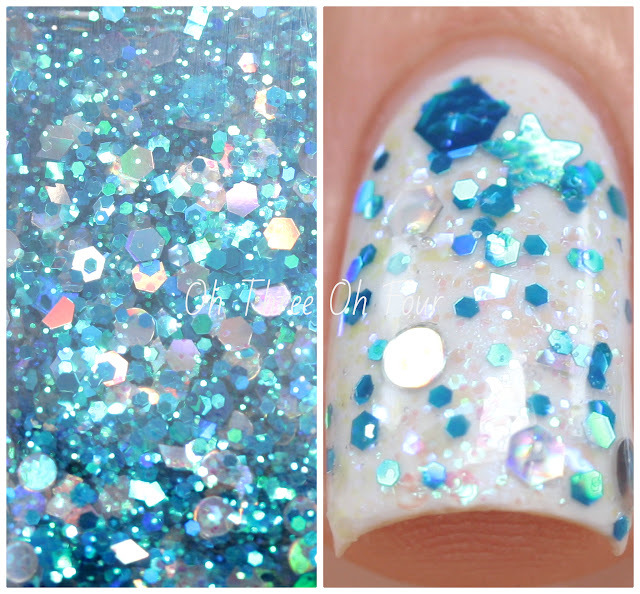 Untrodden Snow is a white based with a blue flash, blue shimmer, and blue micro flakes. Shown is 3 coats with top coat. This collection can be purchased through Blue-Eyed Girl Lacquer's Big Cartel storefront. Sadly I believe St. Nick's Sweet Treats isn't available anymore, but you can still find everything else from this post and more in stock! :) Make sure to follow Blue-Eyed Girl Lacquer on Facebook, Twitter, Instagram and make sure to check out her blog!